This year, in all levels on the intensive courses, you get to speak more than ever. Year after year, UniCor Languages encourages you to enrol in its intensive "Speaking" summer courses. 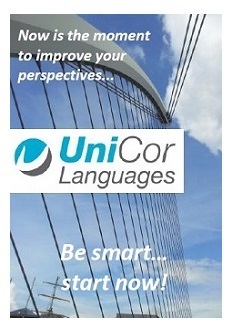 UniCor Languages gives you the opportunity to learn different foreign languages at a high level. Now more than ever, English, German, Portuguese or French languages have become as important as any other element of your curriculum vitae. Take this opportunity to take a step forward towards your personal and/or social success worldwide. This 4-week intensive course will also help you succeed in your official examinations of Cambridge English, Institut Français or Goethe Institute in your university career or at work. From July 1st to July 26th, Monday to Thursday. 4 weeks where you can chat or prepare yourself! ©2005-2019 UniCor Languages. All rights reserved.